Process optimize for free, all your internal repetitive task - save time and cost. Receive/send files through FTP, e-mails. File renaming, suffix/prefix, manage distiller, Pitstop etc. 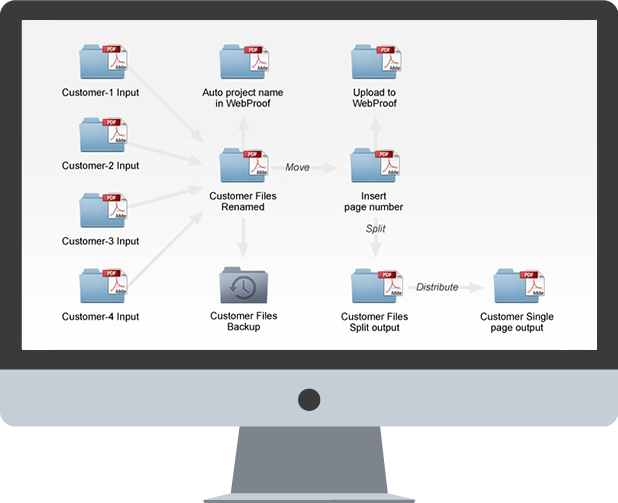 Split files, convert, copy, distribute, centralized SMS and e-mail alert - you name it! If your daily work includes creating ads, brochures, websites, magazines, catalogs, annual reports, packaging, printing and so on - try WebFlow! For professional daily work like creating ads, brochures, websites, magazines, catalogs, annual reports, packaging etc. and all the manual internal processes. Drag and drop files and SMS/e-mail alert etc. WebFlow includes the additional time savings you get, when you integrate with the online proofing WebProof, who has sponsored this free WebFlow. The cost for equal workflows are several thousand of EUR/$ and through moving many functions to the automated workflow you save time and cost at the same time. Register now to download a COMPLETELY FREE and FULLY FUNCTIONAL WebFlow. No obligations at all, the only requirement is Windows. Any information you share with us will remain confidential and won't be shared with any third party companies. Thanks for requesting a Free WebFlow download. You'll receive a confirmation email with download instructions. You can learn more about our company at webproof.com who has sponsored the free WebFlow or you can get back to this site's homepage. It takes less than 5 minutes to download and you'll be testing workflows! It's very simple. You fill in the form on the right, you get an e-mail with your license key and you can now download WebFlow, included sample workflows, sample files and workflow for import. Within 5 minutes you can test how the sample workflows works, see the online tutorial videos. There is free e-mail support, so no excuse for trying how you can automate your internal processes.